Need some ideas for maxing out your next PFT? Here is some insight about the test, and some workout routines to follow. For me, the pull ups were the hardest part of the USMC PFT. If they are giving you trouble, or you need help training for the PFT as a whole, I hope this page will give you some helpful advice and motivation to train! Mastering the PFT will be an essential part of becoming an officer in the Marine Corps. The PFT consists of three events, each worth 100 points for a maximum of 300 points. Score yourself here. Read the full rules here. Major Charles Lewis Armstrong, USMC, used this widely-disseminated program to boost his PFT score to world record levels. A favorite program, with proven results. Click for the official Armstrong Pull-up Program workout. Have you plateaued on your pullup routine? Try the Armstrong Advanced Workout, which is designed to pick up where Armstrong original leaves off. U.S. Marine Corps Officers Candidate School candidate does pull ups on the Initial Physical Fitness Test (PFT) at Officers Candidate School, May 26, 2010. This is the routine I used to prepare for the PFT and thought it gave steady growth in strength. It is a great way for any fitness fan to reach the point of true muscle failure/fatigue. Even if you don’t want to be a marine officer. Do 5 Sets or 75 pull-ups whatever comes first! #1 – Do 1 pull-up, rest, do 2 pull-ups, Rest, and so on until you can’t complete the next set. Your rest should be the same between each set, NO MORE THAN 20-30 SECONDS! Once you can’t complete the next set start over with a new set. Example: Set #1 – 1, 2, 3, 4, 5, 6, 7, 8, 5 = 41 Set #2 – 1,2,3,4,5,6,6 = 27 Set #3 – 1,2,3,4,5,6,5 = 26 Total – = 94 Don’t quit in the middle of a set, because, you hit 75, finish the set! This part of the PFT kills more applicants than anything. People are just intimidated to run. Running can be a lot of fun if people do it the right way. Here are a few steps to getting off on the right foot. 1. Consider running with a partner. Running can get very boring by yourself. 2. Start at a pace and distance you are comfortable with and build steadily. Having said that, don’t be afraid to push yourself outside of your comfort zone relatively soon. The key word is START at a comfortable pace and distance. 3. Every run does not have to be lightning fast. Run at a pace that you can comfortably converse with your running partner. 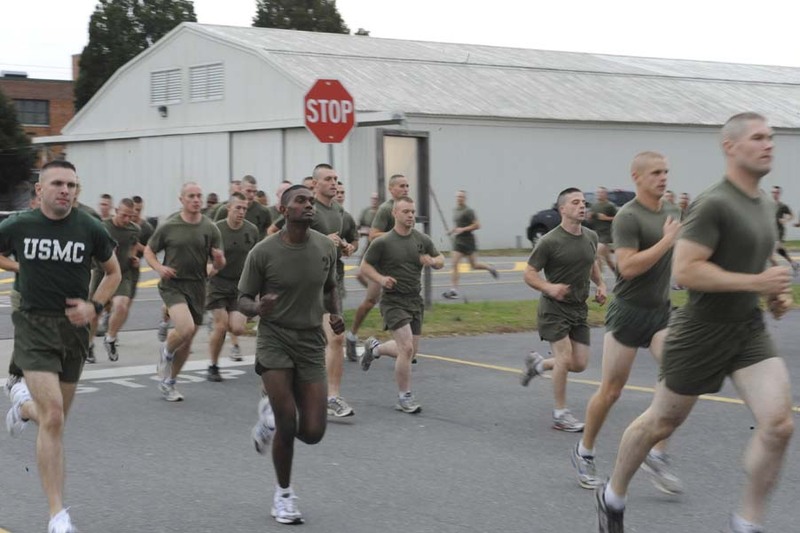 U.S. Marine Corps candidates from Delta Company carry out the Physical Fitness Test (PFT) at the Officer Candiate School (OCS) aboard Marine Corps Base Quantico, Va., Nov. 30, 2009. 4. Run slower at the beginning of your run and work into a faster pace. Always finish a run strong instead of starting like fire and sputtering across the finish line. 5. Look where you are going to instead of at your shoelaces or the pavement. 6. Run at least 3 times per week every week. Work up to 4 or 5 days per week even if you only run a mile or two on some days. Remember that there are many ways to improve your run time. The key to a good run workout is not overall mileage or speed work but consistency. Plan your runs and run your plan. Believe it or not, ANYONE can run below 18:00 minutes if they put forth the effort. If you do put forth the effort now, you will be reaping the benefits at OCS. Here are some of the key elements that I have incorporated into my run workouts to help me. I have not done all of these at once but have done all of them at one time or another. This is the backbone of any run program. These runs are anywhere from 3-5 miles at a comfortable pace. This type of run should be done at least 2 times per week in anyone’s workout. These runs are a slow to comfortable pace for 5-10 miles. 10 miles intimidates most. Build 1 mile at a time. These runs are very effective at building endurance and should be done at least once every two weeks for any intermediate or better runner. Hate running? Want Less Train and More Gain? It sounds like a late-night commercial gimmick, but according to recent scientific studies, you can improve health and aerobic performance with less training. Interval training should be done once someone has advanced beyond the very beginner stages of running. There are two main types I have used. One method is where you go for a 3 mile run running at a sprint for a quarter mile and then jogging very slowly for a quarter mile. The variant method would be to run at a track and rest between each interval. The normal interval here would be 1/4 to 1/2 mile. The 1/4 mile sprints should be run at approximately 20% time of your current mile race pace. In other words, multiply your mile pace by .20 and that will give you your approximate pace for the 1/4 mile. Ensure you maintain a consistent pace during each interval and from interval to interval. You should do this once per week and start by doing 4-6 repetitions increasing 1-2 repetitions per week until you get to 12. Find a hill of medium grade that is anywhere from 20-100 yards long. Sprint to the top, jog slowly to the bottom. Start doing this for 10-15 minutes per training session. Increase five minutes per session until you get to 30 or 45 minutes. Find a good 2-5 mile course. Jog at your medium comfortable pace. Stop every 1/4 mile and do 10-30 repetitions of some exercise (i.e. push-ups, pull-ups, sit-ups, mountain climbers, lunges, dips, jumping jacks, 8 count body builders, flutter kicks, etc, etc.) If you want to emphasize upper body conditioning, cut the run down to 1-2 miles and stop every 50-100 yards.